Prior to enrolling in the National Early Care and Education Learning Collaborative (ECELC) program, staff at C.A.R.E. for Me Children’s Learning Center in Pennsauken Township, New Jersey, neither monitored the food children brought from home nor did they promote family style meals. The food many parents were providing were unhealthy and it was quite difficult to change this common practice. However, the ECELC program presented center director, Keisha Wright-Daniel, and her staff with a platform to develop and enforce a Healthy Meals Policy. The center no longer permits sugary drinks or sweets to be served to their children. The snacks they provide consists of fruits, vegetables and whole grains. Changing their food choices allowed the children to develop a taste for healthier foods and water. Another change the center has implemented is family style dining during morning and afternoon snack times. It occurred to staff members that even though parents provided lunch, family style dining could still take place. Teachers no longer set the table and hand out snacks. The children are now in charge and they love it. Changing the routine has strengthened the children’s social and emotional skills as well as their independence. Jackson Child Care in Virginia was randomly selected as one of the winners in the LMCC Fall 2015 Action Plan Contest and received a family style dining kit. The family style dining kit contained child size dining items, which allowed children to serve themselves with minimal assistance from teachers. Children became more confident in their self-help abilities. This guide is intended to help early care and learning professionals and their programs, including center-based, family child care, Head Start and public preschools, successfully implement Family Style Dining practices. 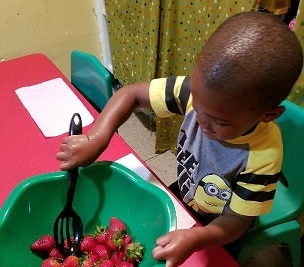 This guide focuses on serving meals family style with toddlers and preschoolers, though after-school programs may adopt these practices as well.